The bestselling Dragon Stone Saga has sold over 200,000 copies in the US and the UK! Discover this epic fantasy series by bestselling author Kristian Alva! 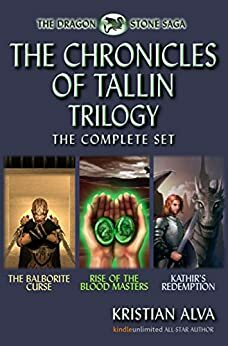 The Chronicles of Tallin Trilogy is now available in one complete set. The Chronicles Of Tallin Trilogy The Complete Set Including The Balborite Curse, Rise Of The Blood Masters, and Kathir’s Redemption by Kristian Alva is a great YA fantasy to enjoy. The particular world that she has created for these characters is captivating and will pull you into it. The characters were well rounded but not particularly going through a huge character arc throughout the stories. However, the characters have distinctive attributes that make them interesting to read about. For the younger audience, this is a good book for them to enjoy if they are looking for a new fantasy book to get into. The way that the book is spaced out in-between paragraphs is a little weird for my taste, but I think that the younger audience will appreciate the many breaks that are consistent throughout the book. There are not overly descriptive scenes or unnecessary backstories that give more information than is needed. The YA audience will thoroughly enjoy this trilogy if fantasy is their cup of tea. Well-written, solid piece of YA fantasy. I thought it was a fun trilogy, I enjoyed the books and would recommend it to librarians, parents and educators seeking a good starting point for their young readers transitioning to YA level material. The writing is very clean, with character voicing stable throughout the trilogy, and plot points remaining consistent. The characters aren’t all complex, but some do evolve from whole-cloth cutouts to far more dynamic and interesting figures. The story touches on some relevant and teachable issues common nowadays, such as the perils of despoiling natural resources, the inevitable damages to both sides during warfare, and the very real problems that arise from species extinction. Of course, common human follies like greed, classicism, and bigotry get touched on. None of that is heavy handed, and it’s not preachy. Overall, I’d recommend the series to any young reader who’s ready for some fantasy, but might still be a bit too daunted by Tolkien to jump into Lord of the Rings.